I recently received a letter from a woman whose church’s children’s ministry was wondering if the new Christmas film, “The Star,” is worth seeing. There are no reviews yet, but there is a considerable amount of promotion. What most see when Googling this movie is a Shrek-like retelling of “the Christmas story” through the eyes of the animals. But it is only loosely based on the real biblical account of Christ’s birth, with a whole lot of made-up fantasy backstory. From the trailer and press release, I caught a couple of details that you might want to consider. First, the soundtrack by Mariah Carey plays in the background with the lyrics, “that’s what Christmas means to me,” which is subtly pushing the idea of relativism – instead of truth, it’s whatever truth is true in your own heart. Did you catch that? 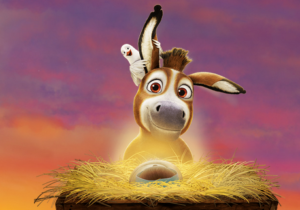 The hero of the Christmas story isn’t Christ, it’s Bo the donkey and his friends. The Advent of Christ’s first coming is an integral part of the Gospel. But many parents who are desperate for a family-friendly film might not realize the implications of embedding a different Gospel into their children’s’ impressionable noggins than what God’s Word tells us. Are the producers using Christ to entertain us, or are they truly telling us why He came? 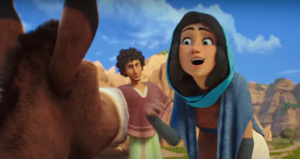 The Hollywood star-power behind The Star is just impressive enough to hook the unwise into thinking they’re doing their kids a favor by exposing them to the hilarity of Mary and Joseph as joke-wielding cartoons. The mixed bag of voice actors come from a variety of backgrounds: The cast features Steven Yeun of “Walking Dead” fame as Bo the donkey, Gina Rodriguez (Mary), Zachary Levi (Joseph), Keegan-Michael Key (Dave the dove), Kelly Clarkson (Leah the horse), Anthony Anderson (Zach the goat), Aidy Bryant (Ruth the sheep), Ving Rhames (Thaddeus the dog), Gabriel Iglesias (Rufus the dog), Patricia Heaton (Edith the cow), Kristin Chenoweth (Abby the mouse), national radio personality Delilah Rene (Elizabeth), Christopher Plummer (King Herod), Kris Kristofferson (Old Donkey), and Tracy Morgan (Felix), Tyler Perry (Cyrus), Oprah Winfrey (Deborah) as the three camels.